Know about the life of Pandit Jawahar Lal Nehru, freedom fighter and the first Prime Minister of India in this short biography. Freedom fighter, India`s first prime minister, noble statesman, social reformer and erudite scholar - throughout his life Jawaharlal Nehru donned many hats and all with poise and equanimity. His immense contribution to the freedom movement notwithstanding, Jawaharlal Nehru`s appropriate place in Indian history would be that of the architect of free India. Entrusted with the responsibility of leading the free nation and delivering on the promise made to the millions of countrymen, Jawaharlal Nehru played a definitive role in laying the basic building blocks of a socialist democratic nation. Apart from launching a range of initiatives to facilitate development in all sectors, Nehru enriched the soul of the nation with the tenets of secularism, social justice and non-alignment. While Pandit Jawaharlal Nehru was a beloved leader of the masses in the freedom struggle, his tenure as India`s prime minister was marked by many controversies. He was accused of nepotism consequent to the election of daughter Indira as the Congress president in 1959. Many alleged that Nehru`s pacifist policies caused Indian Army`s humiliating defeat in the 1962 Chinese invasion. Jawaharlal has been dubbed by many historians as an aristocrat who never connected with the masses the way other leaders did. Jawaharlal Nehru was the patriarch of the Nehru-Gandhi family, which is often called the First Family of Indian politics. Over the years, the term Nehru-Gandhi dynasty has been more frequently used, given that three members of this family have become Prime Minister of India. Apart from Nehru, the other two are Nehru`s daughter Indira Gandhi and Indira`s son Rajeev Gandhi. After Rajeev`s assassination, his wife Sonia Gandhi has been chosen the President of the Congress Party. Jawaharlal Nehru was well-known for his love for children and he took many steps to ensure educational development of Indian children. Nehru`s birthday, November 14, is celebrated in India as Children`s Day. Children addressed him as Chacha Nehru which means Uncle Nehru. `The Discovery of India` was a manifestation of Nehru`s wisdom and literary genius. Widely regarded a classic among books by Indian authors, Discovery of India chronicles the growth of the Indian nation from the days of Indus Valley Civilization to the British Raj. Nehru wrote this book during his incarceration from 1942-1946 after the Quit India movement. The ubiquitous Nehru Jacket is named after Jawaharlal Nehru who took to wearing this attire after shunning his Western wardrobe. Barring the distinctive stand-up collar, the Nehru Jacket is similar to the waistcoats or suit jackets. It is the preferred formal wear for many Indian politicians. 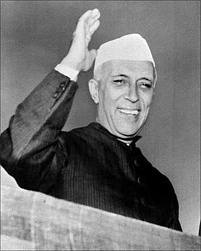 Jawaharlal Nehru was born on November 14, 1889 in Allahabad, Uttar Pradesh. Born with the proverbial silver spoon, Jawaharlal had a western upbringing and studied in the famous Harrow School and Trinity College in England. In 1916, at the age of 27, Jawaharlal married Kamala Kaul and the following year saw the birth of their only child Indira Priyadarshini. After an initial brush with legal practice, Jawaharlal Nehru joined the Indian National Congress and started his political career under the tutelage of father Motilal Nehru. After the successful Champaran and Kheda Satyagrahas, Mahatma Gandhi emerged as the undisputed leader of the masses and Nehru soon became one of his trusted aides. Under Gandhi`s influence Nehru shunned his western lifestyle and traveled extensively to garner resistance against the British. Through the 1920s Jawaharlal Nehru earned accolades for his passionate anti-British stance and was elected Congress Party president in the 1929 Lahore session. Nehru played a prominent role in the 1930 Salt Satyagraha launched by Gandhi and when Congress called for the historic Quit India movement in 1942, he and Subhash Chandra Bose were at the forefront of the mass protests against the government. The moment of freedom has arrived and after some internal conflicts in the Congress Party Nehru was chosen as the head of the interim government. He took office as the first Prime Minister of India on August 15, 1947. As Independent India`s prime minister, Jawaharlal Nehru launched a series of economic and social initiatives in line with his vision of a socialist Indian nation. Apart from domestic issues, Nehru emphasized on forging alliances with other like-minded countries and was instrumental in founding the Non-Aligned Movement. The 1962 Chinese invasion of India`s northeastern states was a big setback to Nehru`s peaceful policies and his government also had to face corruption charges. After a period of illness, Pandit Jawaharlal Nehru passed away on May 27, 1964. Apart form his role as a freedom fighter and a statesman, Jawaharlal Nehru is widely regarded the founding ideologue of the Indian Republic. Education in some of the best institutions, extensive travel in Europe and a sound grasp of world history all contributed towards shaping the thoughts and philosophy of Jawaharlal Nehru. Throughout the freedom struggle Nehru remain devoted to Gandhian principles and the precepts of nonviolent movement. Much of the initiatives launched by Jawaharlal Nehru as India`s prime minister were the manifestations of his philosophy and beliefs. Right from his youth Nehru espoused socialism and as the head of state, he laid the foundation of a socialist economy. Under him, the Indian government exerted control over the fundamental sectors of the economy and spawned mammoth public sector enterprises. Jawaharlal Nehru also projected India as a secular nation and promoted religious tolerance. He believed that secularism will act as the uniting force in the diverse, multi-religious Indian society. Besides taking steps to improve the status of Indian women, Nehru also created frameworks for better representation of minorities and socially disadvantaged groups in government service. Whenever one sets about assessing the life and works of Jawaharlal Nehru, the realization invariably dawns that Nehru`s contribution to India`s destiny as its first prime minister was in no way less significant than his pivotal role in the freedom struggle. Come to think about it, Nehru`s very election as the prime ministerial candidate was steeped in bitter controversy and his initial days in office were marked by a wave of intense communal violence sweeping across the country. As being chosen as Independent India`s first prime minister, Jawaharlal Nehru addressed the Constituent Assembly of India on the eve of India`s Independence and in a soul-stirring speech entitled `A Tryst with Destiny,` he passionately enumerated the responsibilities that come with freedom. Nehru envisioned a socialist India and the first step towards this end was taken with the setting up of the Planning Commission of India and the first Five-Year Plan in 1951. Pandit Nehru realized that modernization and technological development were vital to the growth of the nascent Indian economy and the government took upon itself the task of establishing strategic industries. Public sector enterprises became the pillars of the economy while the government concentrated on providing electricity, healthcare and roads to the rural population. Efforts were also made to augment agricultural production and to alleviate poverty. Simultaneously Jawaharlal Nehru`s government invested heavily on setting up of educational institutions of pre-eminence such as the All India Institute of Medical Sciences, the Indian Institutes of Technology and the Indian Institutes of Management. Nehru also envisaged plans to ensure free and compulsory elementary education for rural children. He espoused the doctrine of secularism and launched initiatives to improve the status of socially disadvantaged groups. Nehru was also India`s foreign minister and under him non-alignment became the guiding principle of India`s foreign policy. Despite entrenched acrimonies, he tried to improve India`s relations with China and signed the 1954 Sino-Indian treaty based on the tenets of Pancha Sila. However due to his pacifist nature, needs of Indian armed forces were put on the backburner and only the defeat of the Indian Army at the hands of the Chinese in 1962 finally made him woke up to this reality. This humiliating episode alone took much of the sheen from his invaluable contribution to the nation as its prime minister.